Everyday Russian is a site for Russian language learners of all levels, as well for those who wish to continue enriching their language skills. 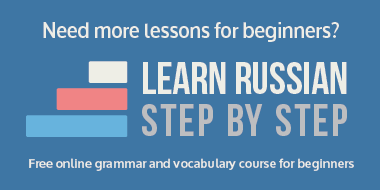 There you can find lots of free lessons for improving your Russian skills. The main goal of the site is to provide you with more opportunities to practice your Russian. Authors do their best to make the lessons not just useful but fun and interesting too. Each lesson includes audio recorded by a native Russian speaker and transcript in Russian. All materials are completely free. In this category complete beginners can find useful materials to practice and to consolidate the knowledge they already have. A word illustrated with examples. With the «Word of the Week» you can learn new Russian words, as well as practice your listening and reading skills with the audio and transcript. The situations you are likely to come across in your daily life. On various examples you can learn how to understand the people around you and to express yourself. Common phrases, idioms, slang and other expressions that would help you sound more native. With the «Phrase of the Week» you can learn common Russian expressions, as well as practice your listening and reading skills with the audio and transcript. Facts, stories, excerpts from books and much more in this section. This is the richest part of our content, with reference to “new words” and “language tricks”, mostly for the advanced level. An opportunity to test your language proficiency with a variety of tests. In each lesson, the authors take two or three verbs as examples, and drill their conjugation. You’ll see all their forms in present, past and future tenses, subjunctive and imperative moods, as well as their derivatives – participles and gerunds. With constant practiсe, your difficulties with this tricky part of Russian grammar will melt away. In each edition a noun is declined in its singular and plural forms in all cases. In addition, each lesson will contain some examples of case usage. Learning the way a word is formed could help enormously with memorizing vocabulary. The authors take a word and give you its most common derivatives with their collocations. With a corresponding audio, of course. This series of lessons helps you train your listening comprehension and writing skills at the same time. Firstly an audio-recording of a small text goes, read a few times at different speeds. In a few days, when the transcription is released, you can see how you coped with the task and analyze your mistakes. And what is the most interesting – the site is currently available in English, Spanish and French!